President Vladimir Putin’s summons to the oligarchs for dinner on December 18 turned out to be a teddy bears’ picnic. And why not – they got all they came for, and more. The country outside got decidedly less, but for the time being how little is a state secret. 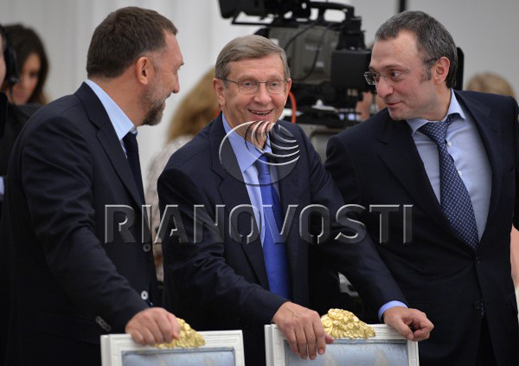 In the authorized version, scribbled by Alisher Usmanov’s (lead image, left rear) reporter, Andrei Kolesnikov of Kommersant, Oleg Deripaska (left, front) was at his seat laughing at a joke he shared with the two on his left — Vladimir Yevtushenkov, the accused embezzler of state oil assets who was released from house arrest earlier in the day; and Suleiman Kerimov, the senator from Dagestan who controls Russia’s largest goldminer and potash producer, Polyus Gold and Uralkali, through a charitable foundation seated on the banks of Lake Lucerrne, Switzerland. The photograph shows wan smiles. The joke, however, was real. 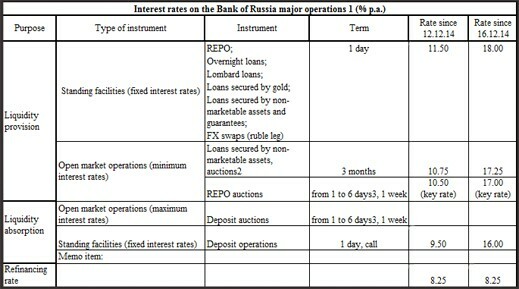 In a regulation released on December 17, the Central Bank of Russia (CBR) ordered “a temporary moratorium on recognition of negative revaluation of securities portfolios of credit institutions and non-bank financial organisations that will decrease market participants’ sensitivity to market risk.” That’s an order to the Russian banking system not to issue margin calls to debtors who have pledged as security for their loans shares which have plummeted in value recently. The creditworthiness of Yevtushenkov’s and Kerimov’s borrowings has been hit by sharp declines in the market capitalization of their shareholdings. In the year to date market capitalization for Yevtushenkov’s Sistema has dropped 85%; click for the story. For more on Kerimov’s Polyus Gold, read this. Polyus Gold has lost 62% of its value; Uralkali, 56%. 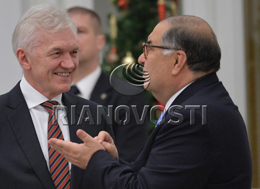 Gennady Timchenko (left), the one oligarch at the table on Friday to have been sanctioned by the US as one of Putin’s “cronies”, also had reason to welcome the bailout as Usmanov (right) calculated the value on his fingers. So too, Leonid Mikhelson, at the same table, who is the control shareholder of Novatek, which has been sanctioned institutionally. If one can palm off the rise in CBR interest rates which was announced on December 16, one needs less than five fingers to calculate the size of the personal favour since Putin announced it publicly at his national press conference on December 18. The government commission, to which Putin refers, has not been officially gazetted yet, nor reported to the State Duma. 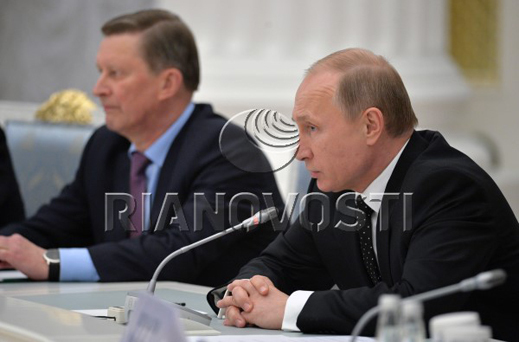 It appears to include the two officials seated to Putin’s left at the table – First Deputy Prime Minister Igor Shuvalov and CBR Governor Elvira Nabiullina. From informal remarks by Prime Minister Dmitry Medvedev, Shuvalov appears to have been designated chairman in charge of assigning interest rates to applicants; Nabiullina’s job is to do what she’s told and pay out of CBR reserves on presentation of the approved invoice. 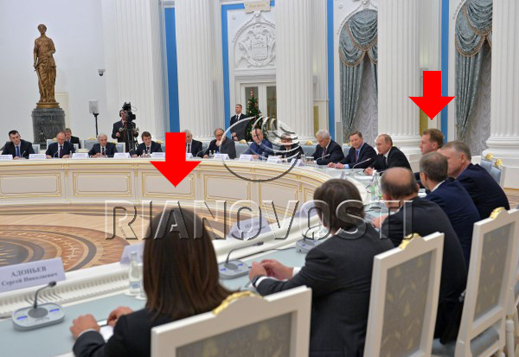 Look carefully at the official table chart, and then the real one: you can see that Nabiullina, officially second on the president’s left beside Shuvalov, was downgraded. When the music stopped and Putin sat down, Nabiullina was relegated to a seat between Pyotr Aven, Vagit Alekperov of LUKoil, and Dmitry Ananiev, one of the owners of Promsvyazbank, which failed to get its shares listed in London in 2012. For that story, read this. That the special interest rate scheme will not apply to borrowers who can’t shake hands with Shuvalov is indicated by the state savings bank Sberbank’s decision this week to raise its home mortgage rate to 16%. Sberbank and VTB have also announced they are not accepting individual or small-sum loan applications for any price until next February, at the earliest. Just who will qualify for a Shuvalov bailout is indicated on the list Putin invited to sit with him on Friday, who have never been there before. 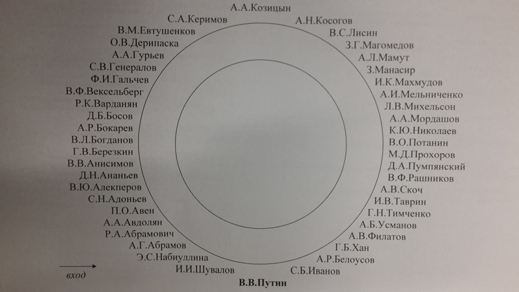 According to a source at the Russian Union for Industrialists and Entrepreneurs (RUIE), which has arranged these annual reunions in the past, Kerimov is not a member nor a past attender. Neither is Andrei Skoch, a 20% shareholder in Alisher Usmanov’s iron-ore and steelmaking holding, Metalloinvest. His record as an asset raider in the steel business has complicated every attempt Metalloinvest has made to list its shares on the London Stock Exchange (LSE). About Skoch, click. 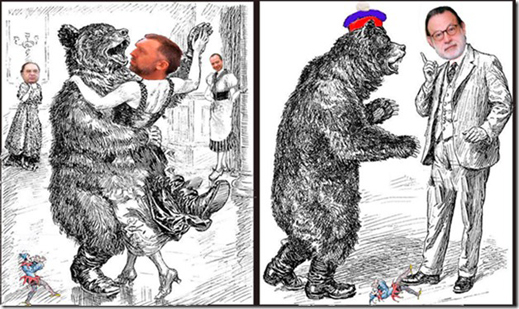 Nor has Dmitry Bosov (lead image, right of Deripaska) been a Putin favourite before. He cut his teeth, so to speak, in the aluminium wars of the 1990s. Recently, he and his Alltech Group attempted but failed to achieve an initial public offering for Siberian Anthracite. For the Bosov file, read this. For Bosov’s inability to save his investment in Matra Petroleum from delisting from the Alternative Investment Market (AIM) earlier this year, read on. 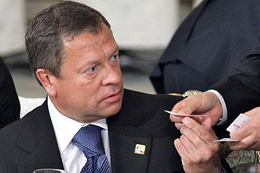 One oligarch, who won’t be qualifying for the presidential interest rate and the Shuvalov handshake, is Igor Zyuzin (right), the control shareholder of specialty steelmaker and coalminer, Mechel. His company is being pushed into a state bank takeover on terms Zyuzin is proving too weak to resist. For that story, click. A source at RUIE confirms that Zyuzin was on the guest list for the 2013 picnic, but not this time round. He adds that he hopes such details won’t cast a negative shadow on this year’s affair. 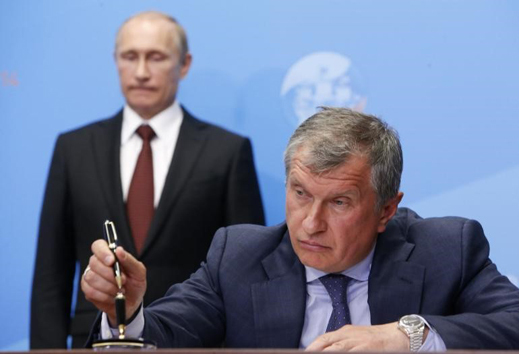 Putin did not respond to the view, widespread in the business media and in the Moscow market, that he and Sechin obliged Nabiullina to fund Rosneft’s Rb625 billion bond issue this month at an especially favourable interest rate. The allegation is also that they then allowed the conversion of the proceeds for Rosneft’s debt instalment repayment in US dollars without regard for the impact the transaction would have on the rouble exchange rate on December 16, Black Tuesday. One commercial banker in Moscow alleges also there was a form of insider trading of the bonds called “front-running”, which is illegal in most markets. Another source in a position to know says there was no favouritism. Once the Kremlin had decided Rosneft would meet its foreign debts on schedule, without declaring force majeure in relation to the US sanctions, he says the financing of this week’s repayment was a standard, and a legal, operation. Another source claims the Rosneft bond interest rate was so attractive “at least one other party bought its way into the buyers’ club. 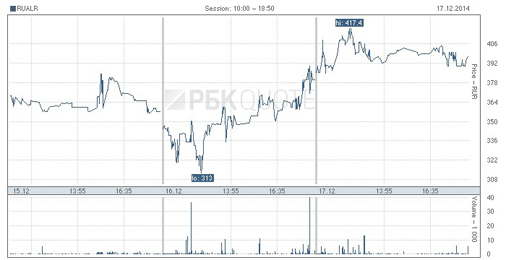 “ An insider close to Rusal claims Deripaska found extra cash the day after Black Tuesday to boost the share price of Rusal with an unusual volume of rouble turnover on the Moscow exchange — at the same time as the hard currency share price was diving on the Hong Kong Stock Exchange. Alexei Kudrin, the former finance minister (right), started by criticizing Putin and Nabiullina last week for their timing on managing the rouble crisis. For Kudrin’s tweets, click. This week Kudrin has announced through the Financial Times that Putin is obliged to choose between capitulation in eastern Ukraine and capitulation on the home front. “As for what the president and government must do now,” Kudrin declared, “the most important factor is the normalisation of Russia’s relations with its business partners, above all in Europe, the US and other countries.” Kudrin claimed to the newspaper that 40% of the rouble depreciation is due to the sanctions war. 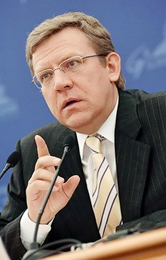 Kudrin announced his candidacy for prime minister in Washington in September of 2011, before he was fired; Putin said at the time that Kudrin had suffered a breakdown. This time Kudrin’s candidacy to run Russia is sponsored from London, as he places himself at the head of what the Kremlin faction of security officials is calling the Fifth Column. The security faction is led by chief of staff Sergei Ivanov; it is represented in public by the Novorussian commander Igor Strelkov. Read more. Kudrin’s declaration is against Ivanov, the accession of Crimea, and the Ukraine campaign. He is bidding the oligarchs to join him. So is Putin. This dance will resume after Old New Year.